Gregory Poole has been a partner to farmers in eastern North Carolina since 1951. We are your authorized Cat® dealer offering service and support for the full line of ag equipment. In addition to sales and service, we can help match you with quality used parts that make major repairs and maintenance cost-effective — a key advantage in a competitive economy in which keeping overhead expenses low is a priority. Gregory Poole maintains an 8,000-square-foot warehouse and a five-acre storage yard dedicated exclusively to used parts. 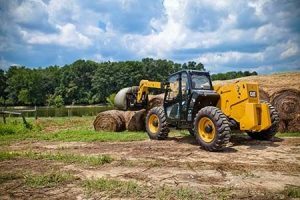 Working with our clients and other dealers, we are constantly expanding to offer more options to anyone looking for used agriculture and farming equipment parts. Whether you are in the market for a replacement bucket for a Cat wheel loader or a used component for a dozer, we can deliver — often in 24 hours or less. In the unlikely event we don’t have what you need in stock, there’s a good chance we can source it from our extensive network of partners. Buying used may save you money, but it’s only a good long-term investment when you purchase from a dealer you can trust. At Gregory Poole, our team of factory-trained technicians inspects and repairs all of our used ag equipment parts. We base our reputation and our integrity on the honest service we provide our clients, and used parts sales isn’t something we take for granted. When you shop Gregory Poole, you are buying a part that will deliver excellent value for the money and all the performance you associate with Cat. Buying used isn’t just an economical alternative to buying new — in many cases, it can save you time, too. When facing a backorder or another delay on a new replacement for a key component, it is often faster to buy used instead. In a tough economy, in which many farmers and agribusinesses face tight timelines and thin profit margins, minimizing downtime is essential. When it comes to critical repairs for your fleet of heavy equipment, buying used can make all the difference. Learn more about the benefits of buying used farming equipment parts from Gregory Poole by contacting our office today!